Let’s just say, that I did not overstuff the blender while making this lovely pie, and let’s just say that my sister’s books, her favourite bag were not ruined, and then we can call this the perfect Thanksgiving story. After all that’s what Thanksgiving is for, giving thanks that she hasn’t planned her revenge yet. 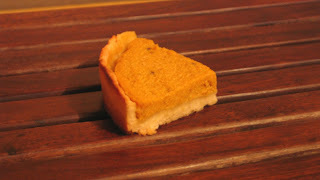 This is an eggless, Pumpkin pie. It’s as delicious as the traditional thanksgiving pumpkin pie. Sieve the flour, baking powder and sugar together. Rub the butter into the flour mixture. Bring the mixture together into dough, sprinkle a few drops of chilled water and bind the mixture. Chill it for twenty minutes in the refrigerator. Divide the mixture into equal halves. Roll out one half into a round the size of the base of the pie mould. Use the other half to line the sides of the pie mould. Prick the base with a fork. Bake the crust for twelve to fifteen minutes, until the inside of the pie crust is cooked. To make the filling, boil cut pieces of pumpkin in water. Once the pumpkin is cooked and squishy, peel them. In the blender, add in pumpkin, sugar, tofu, cinnamon and blend it into a smooth mixture. Add a little milk if the mixture is too thick to blend properly. Fill the pie crust with pumpkin mixture completely. Bake for forty to fifty minutes, till the pie sets. Allow it to cool for thirty minutes before serving.